An endless stream of real world opponents in need of a beating. 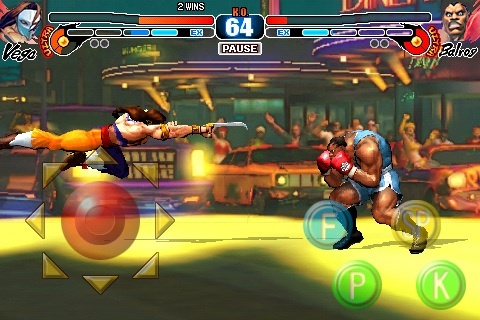 Last year, Capcom did the unthinkable, releasing a port of Street Fighter IV on the iPhone, a game that was surprisingly enjoyable, given the platform's limitations. While not as fluid as the Xbox 360 and PlayStation 3 versions, this hard-hitting fighter impressed gamers with its user-friendly controls and sharp looking graphics, making it an instant App Store hit. Turns out, the company has more on the way in the form of Street Fighter IV Volt, an all-new, standalone title set to punch iPhone this July. Although Volt retains the previous game's visual quality, it holds two distinct advantages. First, it has the biggest roster, with 17 world warriors. All of the characters from the last Street Fighter return, letting you decimate opponents as Ryu, Chun-Li and Blanka. 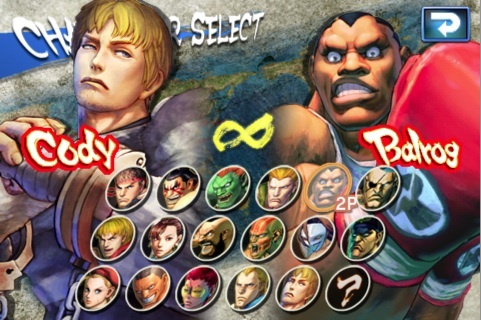 That said, you'll also be able to select three new fighters, series mainstays Balrog, Vega and Cody, all of which possess unique move sets. While that's cool, it doesn't come close to the biggest feature, multiplayer. Capcom designed Street Fighter IV Volt as a two-player experience. As such, you'll be able to mash someone's face online or through Bluetooth. You'll even receive "Here comes a new challenger" notifications whenever someone wants to throw down. Then, you can save replays, providing you have something impressive to show off. This should make Street Fighter IV Volt of key interest when it debuts next month. Of course, if you're on the fence, we'll post a review to see if this portable brawler has what it takes to dethrone its predecessor.